Well you if look back a couple of posts to here you will see we experienced a normal fall day here in Denver. Yep, more than a few inches of snow fell on Wednesday. The trees were still full of leaves so plenty of branches were broken. Many people are still without power. Along with the snow came the cold. Although today is filled with abundant sunshine, it is only 45 degrees outside. 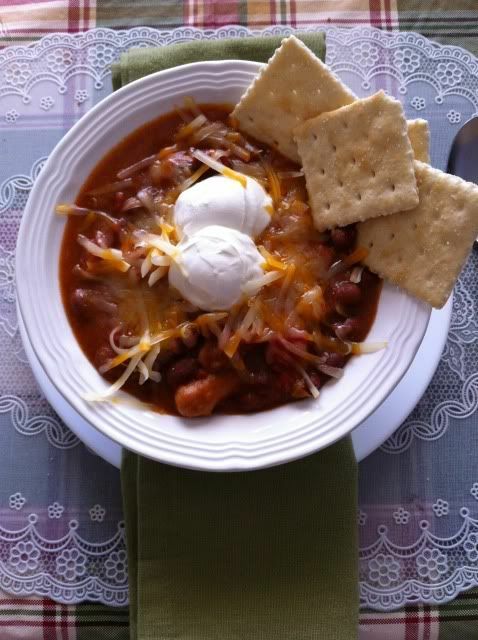 With the cold weather comes Mr. B's request for me to make his favorite pork chili. It is easy enough to make for a weekday meal but I had today off so, chili I made. I start with a few simple ingredients. 2 cans of chili hot beans in chili gravy, 2 cans of diced tomatoes with green chiles (do not drain! ), about a pound of boneless pork chops, cut into cubes (when it's on sale, I will get a boneless pork roast and cut it up into cubes and freeze in one pound portions to have on hand for this chili), and some flour. You will want to place the flour into a plastic bag and add the pork cubes. Shake it really good to make sure the cubes are all covered with the flour. If I know I am making this a day ahead I will place the bag of floured pork in the fridge over night. This gets it to stick really good to the pork. Today, I just set it aside for about a half hour, shaking it again every now and then. Next you want to shake off the excess flour. 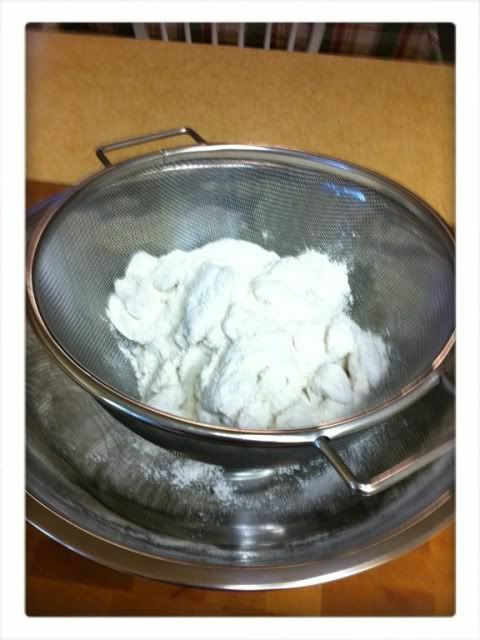 I place it into a wire strainer and shake the loose flour off into a bowl. Heat up a skillet on medium high and add about 2 tablespoons of vegetable oil. 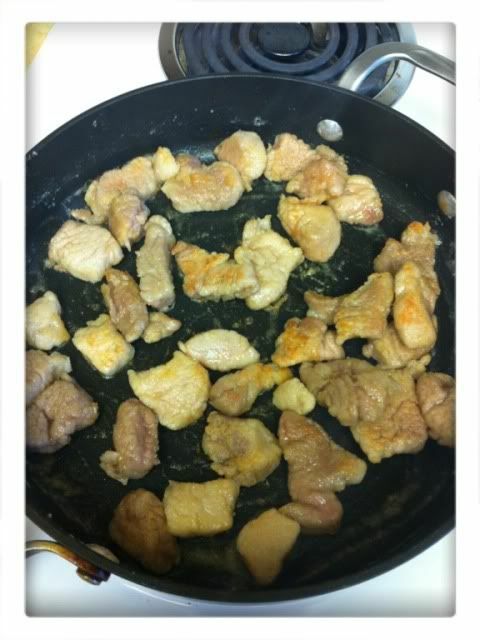 Add the floured pork and cook until it is browned. Sometimes it takes doing this in batches as you don't want to crowd the skillet and wind up just steaming the pork and not browning it. Once you have all of the pork nicely browned, place it along with the chili beans and tomatoes in your slow cooker/ crockpot. Stir it up so that everything is mixed up. 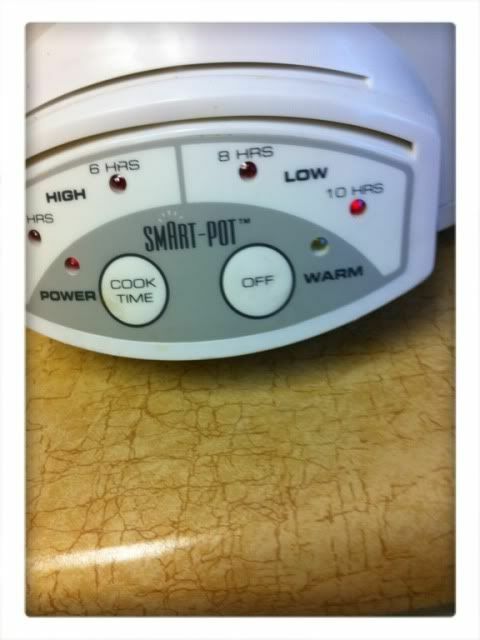 Put the lid on it and let it cook on low all day. Cornbread, hot from the oven, would have been nice too but I didn't have the mixin's on hand for that. Mr B doesn't mind. Cornbread or crackers are just extras. All he wants is a bowl, or two, of his favorite chili! If you make this for your family I'd love to hear how you liked it. Stopping by from the Chili Cook Off over at It's a Blog Party! Yum! We have fresh pig in the freezer, I can't wait to try this. ps, love the name of your blog! 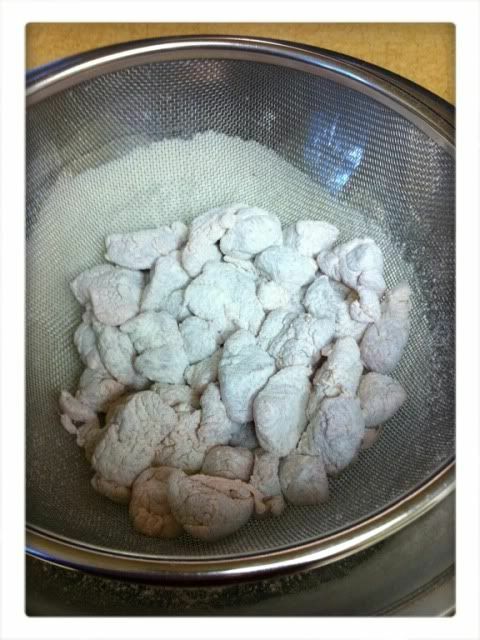 i love the way you dredged the meat in the flour using the strainer... brillant. i posted a pretty fantastic chili recipe on my blog over the weekend. it's a definite winner! Yummy comfort food. Thanks for sharing. I've never made chili with pork before. I bet it's great. Interesting techniques! Thanks for sharing! mmmmm this looks delish!I've never had chili with anything other than hamburger. I bet it's fantastic! I love me some chilli in the fall! This one looks and sounds SO good! Can't wait to try it! We are going to feature it on our blog tomorrow, so that if anybody missed this yumminess, they will be able to catch it ;) Stop by and grab your braggin' button! Thank you for sharing your fabulous recipe on "A Little Birdie Told Me..." Tuesday at Rook No. 17! 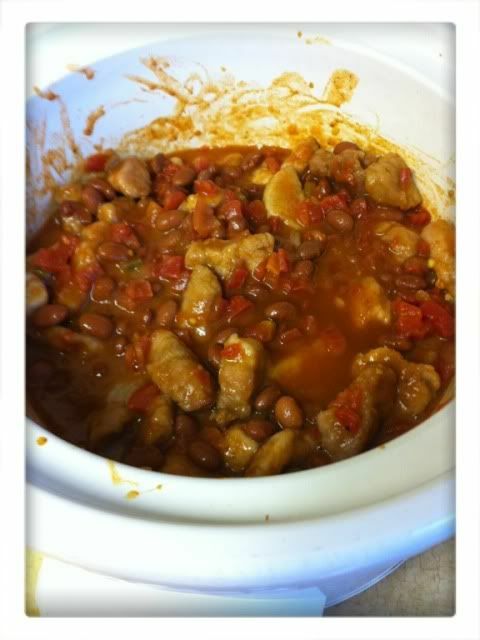 I've sadly never had pork chili but yours looks so good! I know my husband would love this. Thanks for sharing at Taking A Timeout Thursday. So excited to try your recipe, thank a lot for the share. Looks so good, I'd love a big bowl of the chili! This looks so good! Thanks for joining Foodie Friends Friday! Please come back on Sunday to VOTE! G'day! Never had pork chilli before, true! Your photos make me want to do! Seriously, I could eat chili and cornbread every day and never get tired of it! 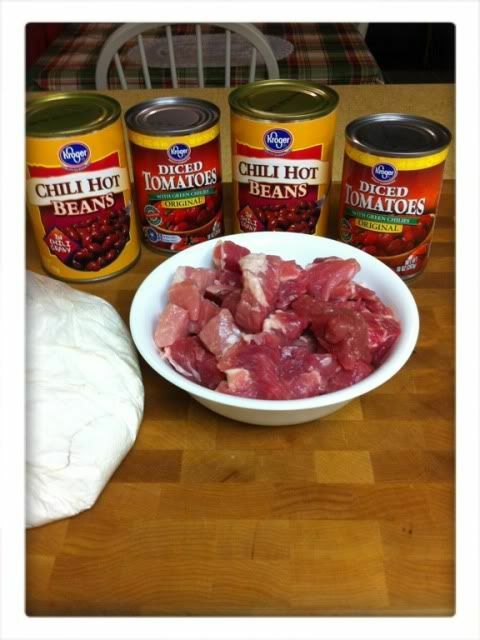 I don't think I've ever made chili with pork, but I'm thinking I need to try it :) Pinned this, Kathe and will share from your FB page to my FB page in a bit!